I’ve now been at Econsultancy for more than 18 months and in that time I’ve written more than 1,000 blog posts. When I first started my background was in journalism and research, so I had relatively little knowledge of digital marketing and ecommerce. Therefore I thought it might be interesting to look back on a few things I’ve learned from working for an online publisher. I had limited knowledge of the digital world when I first got the job, but luckily we had the resources here to enable me to learn the ropes pretty quickly. But it still meant that at first I was writing about topics I knew nothing about. In fact, that still happens from time to time. However the complex and evolving world of digital marketing means that you can’t be an expert in everything and in general I’ve been lucky enough to meet nice people who are more than willing to answer my questions and fill in the gaps in my knowledge. So really it’s best to try and treat each meeting and new blog topic as an opportunity to learn, as cheesy as that sounds. On a similar theme, it’s often quicker to ask someone a direct question than to try and spend ages reading around a topic. I’ve been fortunate to meet a number of people who have been kind enough to help out when I needed information or advice on a blog post. Often my questions are probably quite basic and/or ill-judged, so experts such as Dan Barker, Kelvin Newman, Terence Eden and Henry Elliss deserve high praise for having the patience to answer them. As a journalist the aim of the game is write brilliant content that pulls in as many readers as possible, however there is a balance between bringing in the right type of readers and just chasing traffic for traffic’s sake. I would put Mashable and The Daily Mail in the latter category, however they have very different business models to ours. So while it’s nice when a random link from the Guardian gets you 70,000 extra views over night, if nobody buys anything then it’s all for nought. The best example of this is a post I quickly threw together about Zeebox and ITV’s Dancing on Ice. Normally it would have done extremely well to scrape 1,000 views, but thanks to loads of fans of the show searching for ‘Dancing on Ice’ it attracted more than 20,000 readers. Unfortunately as our digital marketing and ecommerce blog didn’t provide the salacious celebrity gossip these people were looking for the bounce rate was 97.5%, a high watermark that has yet to be beaten. I was originally recruited as part of a plan to launch a news blog for Econsultancy, churning out the latest stories in ecommerce and digital marketing. However, it quickly became apparent that news is nowhere near as effective in pulling in the readers, and the right sort of readers, as tips and best practice posts. The reason being that you can get news from any number of sources and the very nature of that kind of content means that it has a short shelf life. In contrast, if you write a tips post or investigate an issue in some depth then it continues to be relevant and will keep cropping up in search engines. This ‘evergreen content‘ will pull in traffic for months and even years after it was initially published. A certain amount of jargon is unavoidable, however some industry terms sound awful and should be avoided at all costs. Just because our readers work in digital doesn’t mean we have to speak to them using marketing BS. Among the banned words at Econsultancy are ‘learnings’ and ‘synergies’, however the one phrase I probably hate more than any other is ‘thought leadership’. I’m okay using jargon if I feel that if I accidentally used it in conversation with my mum then I could comfortably explain it away as a work thing, but I know that if I dropped in that awful, cheeseball of a phrase she’d never let me back in the house. List posts are an overused medium in blogging, but the ugly truth is that people love to read them. Take another glance at the most popular posts from last year and you’ll see that 19 out of 25 are lists. The simple reason is that it breaks things down into an easily digestible format, and also people are curious to see what points or factors made the list. PRs are caught between the devil and the deep blue sea. They have clients nagging them to get press coverage then they have me ignoring their calls and their emails. It’s not out of spite you understand, but if I answer every email and phone call I receive I wouldn’t have time to do anything else. So though I don’t envy their task at all, many PRs could save themselves a lot of time by looking at the sort of content we publish and targeting their pitches accordingly. That said, many of the PRs I’ve worked with have been excellent and one even helped to organise my wedding. When working at a local newspaper you put puns in headlines by default, it was one of the most fun parts of the job. However as a blogger you need to be concerned with SEO and what people are likely to search for, so there’s no room for bad jokes and wordplay. Long, well researched and tightly crafted articles are fun to write, but they can be a pain to read online. While in newspaper journalism you can occasionally afford to be slightly indulgent with your word count, when you’re blogging it’s best to keep it to the point (this article being the obvious exception). Another trick to make posts more readable is to use subheadings, as it breaks up the page and saves you a few sentences of trying to skilfully swerve onto a different topic. Most of the comments we get on the blog are from well-informed readers who’ve taken the time to add something constructive to the discussion. This means the comment is useful for other readers and also for us as it gives ideas for future posts. However giving people the ability to immediately post the first thing that comes into their head means that we very occasionally get unhelpful trolls making pointless comments. As a newspaper journalist, if someone takes the time and effort to sit down and write a letter to your editor about how bad your articles are then it does make you think that they’ve probably got a point. But you quickly realise when blogging that not all commenters are created equal. At the beginning of last year we wrote a huge amount about two technologies that had reached a tipping point and were about to become the norm – connected TV and NFC in mobile phones. However, fast forward to a year later and consumers still don’t care about either technology, which goes to show that the media, PRs and manufacturers have very little influence over consumer behaviours. With the exception of Apple. With only a week to go before the opening gala of Integrated Marketing Week in New York (June 10th – 13th) we’re finishing up our posts talking about some of the preliminary findings from the report that’s premiering at the event. Today’s changing digital landscape is forcing organisations to re-evaluate their media strategy as the lines between paid, earned, and owned media become blurred. It’s crucial for marketers to find more cost-effective and coherent means of engaging with consumers, and that’s why content marketing has quickly become a key part of any organisation’s marketing mix, today used by nine out of ten marketers. It is not so much a revolution but a rapid evolution and digital transformation. 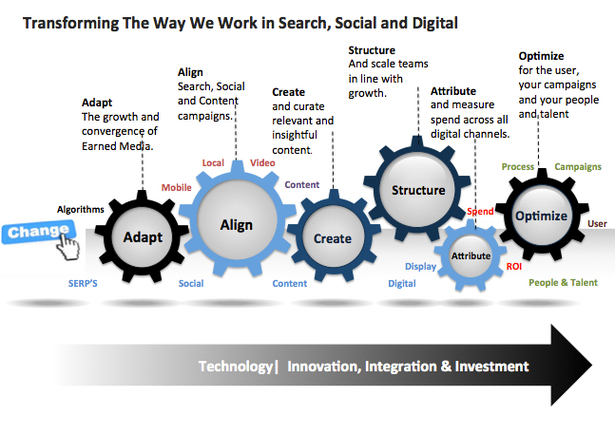 The growth of digital media, the convergence of paid, owned and earned media practices and the rapid growth and adoption of mobile and video have fueled change in the way we work in 2013. If you add to this equation the technological changes and innovation and the catalyst that is social media and content marketing it becomes apparent that dealing and adapting to change is a digital marketing necessity rather than the option that it used to be.